The other day I published a post featuring Jason Rosenberg’s collages and ‘statement’ (as he calls it). 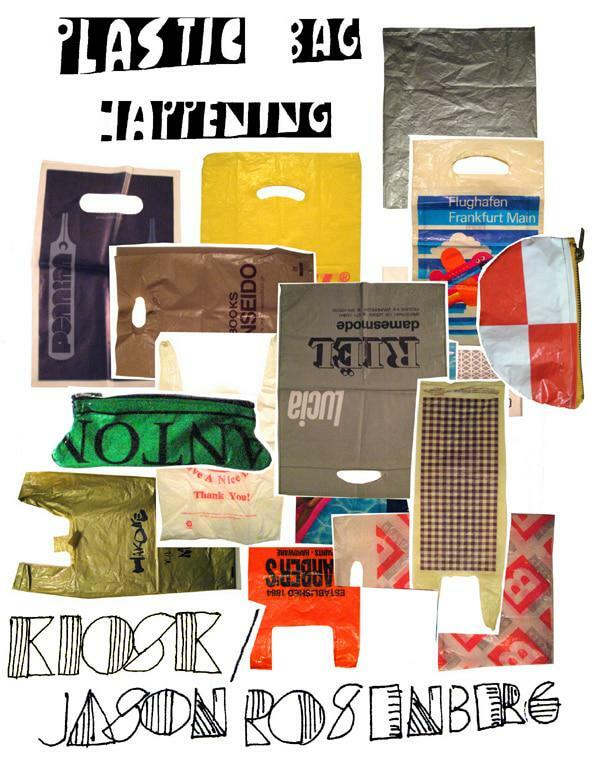 Whilst going through his website I discovered this FANTASTIC project he ran called ‘Plastic Bag Happening’. How it worked was you were invited to come to the ‘Kiosk’, which was arranged to be open for a few days, and bring a plastic bag. Then, when you left, you had to take a different plastic bag with you – in essence, leaving the one you came with behind. This project was basically a ‘celebration of plastic bags from all over the world’ and thus, a cross-pollinationon of colours, textures and ideas. At the ‘Kiosk’ Jason sat at a sewing machine ready to create other related functional items to sell – presumably from the plastic bags. I think this project ran last year in July but non-the-less I loved the idea. Plastic bags are everywhere. Come to Africa and on just about every fence you will see a selection pinned to it (although it is much better now because a few years ago we started paying for the plastic bags). Every country has a different design, style and use for these bags – wouldn’t it be fun and interesting to see them, marvel at the differences, and similarities, and wonder where they have been. This entry was posted in Blog and tagged jason rosenberg, Kiosk, plastic, Plastic Bags. Yes, that is a great project and a nice idea!I think everyone have at home enough plastic bags at home and every country have diffrent bags.Interesting to see how diffrent.